Home blues Birthday Recap - Pics and Makeup Looks! Thank you to everyone for sending me birthday wishes last week. It made me feel so special! Last Wednesday was my birthday and it was a few days of celebration. Of course with this being a beauty blog, I had to share my makeup looks along the way. Wednesday, June 24th was my actual birthday. The boyfriend and I did a quick gym workout and headed to Chilis so I could get some healthy food off of their Guiltless Grill menu. Trying to be good! We then met up with the crew and saw a 10:00pm showing of Transformers. Wow that movie felt long. It was okay, the last 20 minutes were the best. 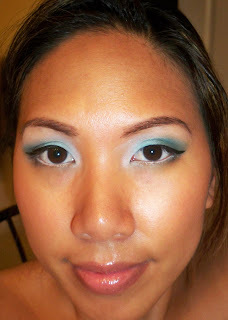 That night I wore an aque look inspired by Makeup By Tiffany D's last Summer Makeup tutorial. I did a quickie version since I only had about 5 minutes to do my makeup. That day I also had a chance to open up some presents from the boyfriend. He awoke me with flowers and wrapped presents on our coffee table. However, when I wake up from work I'm in and out with only a few minutes to spare. I opened them when I got home. Please ignore me looking crazy...I was trying out different eyeshadow colors on each eye, lol. 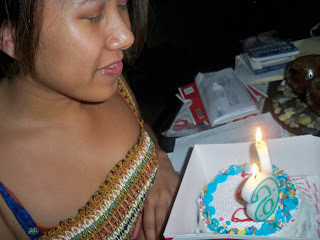 Here I am blowing out the candles on my tiny ice cream cake. 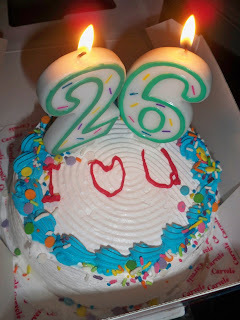 I told my BF how growing up my mom used to always get me Carvel Ice Cream cakes, my fav! He got a mini version so that we could still celebrate with just a little piece while being on a diet. If he had gotten a regular size cake we would have been in trouble! Yay! 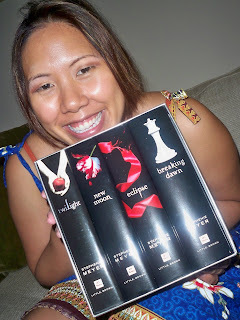 My immediate reaction at the gifts :) By the way, I'm rocking a dress I bought in the Philippines. He also got me a rose for every birthday we've celebrated together. Red for love and a pink in the middle for love and friendship. I wanted my boyfriend to keep gifts more low key this year because we've spent too much on each other in the past. 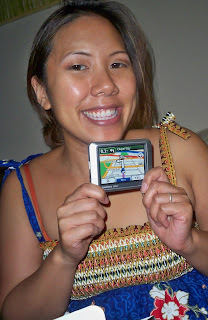 I finally got a GPS! If you know me, I'm the worst with directions...like seriously the worst out of anyone I know, lol. Thursday night my friends took me to a birthday dinner at a surprise location. I was so happy because they took me to a swanky South African Spot! I've been looking around Atlanta to find some tasty African cuisine but the closest I could ever find was Ethiopian. It was super nice inside with a live band and everything. If you're in Atlanta, it's called 10 Degrees South. I ordered a yummy Chicken Curry dish...everyone loved their food. My friends got a card made just for me! 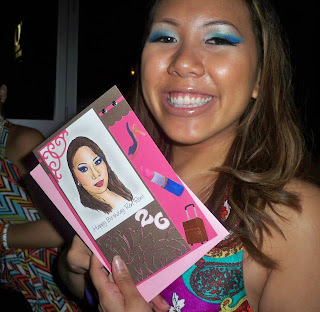 They had the card maker sketch a picture of me using one of my pics on my blog...I think she used my Rihanna Makeup tutorial! Inside they had the card written comparing our friendship to the blending of makeup...it was so cute and thoughtful. This year they surprised me. 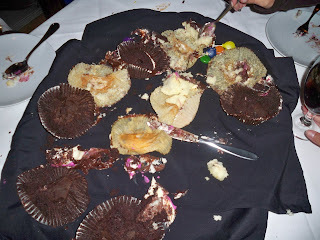 Instead of cake, they had cupcakes! Again, better for my diet so we don't go overboard...at least I thought lol. Each cake had different fillings from fudge, to custard, to vanilla...it was so yummy! We tore those bad boys up! Here's a look I wore for the night. I used the Double Stack Palettes to create this bright blue look along with my Eve Pearl liquid liner and Red Cherry lashes. Besides that I'm wearing Mineralized Satinfinish foundation in NC42. I've fallen in love with this foundation all over again...it gives such a nice, dewy glow. I'm also wearing MAC refined golden bronzer on my cheeks and Bare Bronze lipstick with Liberated Lipgloss. These are quickly becoming staples in my summer makeup collection. Friday night was my best friend's fiance's bday. We went midtown to celebrate. First we ate Tapas and then headed to a Wet Willies style bar. LOL, I didn't take pictures of that night because it was not cute. 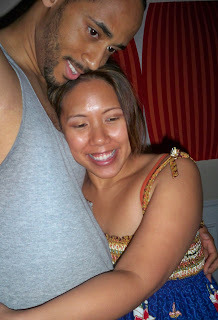 We ended up leaving early because the birthday boy had a little too much that night. Ah well, it was still fun lol. Too bad I have to get my car cleaned now if you catch my drift, lol. Saturday was just for me and the boyfriend. Again, I wanted to keep it really low key. We're going to Savannah this weekend so no need to go crazy with it. We ended up going to the Discover Mills Outlet mall a half hour away. We splurged on the diet and had Johnny Rockets :) Here we are sharing a root beer float. We also were extremely corny and took pictures in a photo booth. While at the mall I stopped by the CCO and actually didn't get anything. Instead I ended up getting a cute flower claw clip and two nail polishes for all of $7...see I'm a cheap date! We picked up a new pair of jeans for the boyfriend...I'm trying to get him to transition into more fitted styles. I also bought 8 pairs of shoes from the Nine West Outlet...nope, not all for me. They're for myself and the rest of the bridesmaids for my best friend's wedding in October. Can't Wait! Of course, a shot of makeup. I went really simple with this one. 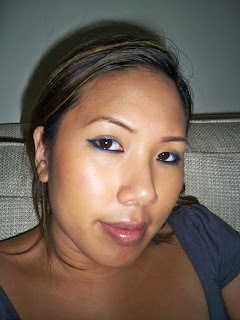 I'm just wearing black eyeliner smudged with a dark blue shadow from the Double Stack Palette. I'm also rocking Stila lipglaze in vanilla and Blonde MSF on my cheeks. Beautiful looks as always, I am Asian myself, every time I use white eyeyliner for my water line, it always makes my eyes more slanted then it is, does it happen to you?? the roses, the cupcakes, the 2nd to the last pic, the gifts. Happy belated bday luv. you look great! :) hehe.. love the makeup. cupcakes not try before. I loooove the pictures! You and your boyfriend make a great couple! i love it! your skin in the rootbeer pic looks freaking AMAZING! 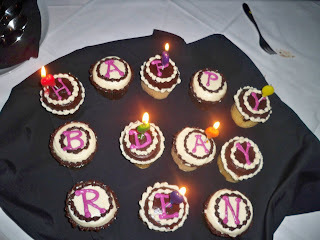 happy belated ren, you totally deserved your big b day bash! you do sooo much! 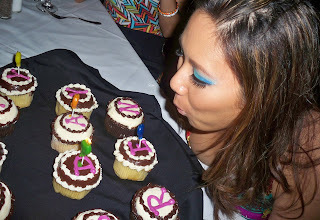 happy belated birthday ate! your makeup looks amazing.... as always! that is so sweet, the roses your man got you. I loved this post. so cute! 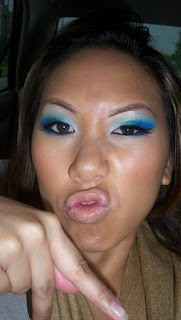 will u do a tutorial for that blue look with the double stack palette? You look beautiful in your looks. You have a great bf and wonderful friends. You deserve it! Happy late bday by the way! Looks like you had a totally awesome b-day, babes. I need a GPS like BAAAD too. And those cupcakes look soooo good. Loves it!! You look so beautiful in all the pics! You & the BF look amazing 2gether!!! I'm trying to make my boyfriend wear more fitted clothes as well! He thinks baggy is cool, but I think it's kind of out of style right now. Haha. it's great to have such great friends that give you meaningful gifts from the heart. that card was so sweet. and it looks like both the bf and the friends thought hard about how to make your day special and non-traditional. love it! You look absolutely stunning in that last pic..I love that look on you, and I'm so buying the double stack to try to recreate your first look. My bf's job is moving him to either ATL or Chicago, if it's ATL I'm hitting u up for a make up lesson lol. aw.... that's so sweet of your boyfriend!! i love all the pix, cakes and you two look so adorable! your bf is so sweet! love all your pix! your b-day make up look so fantastic as always! awww that's so kute & sweet! happy belated bday! nice pics and happy belated bday ! Love the eyes!!! I dunno why i just cant seem to get blues to look right on my eyes lol but ur totally rockin it ! 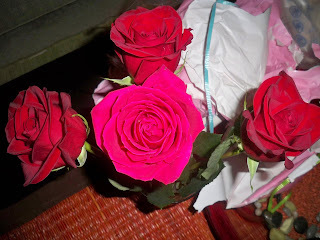 and aww roses ! how sweet ! ren i've recently become one of your blog addicts and just wanted to say you are AMAZING and a huge inspiration to me with makeup! i love your blog they're always so informative and have definitely taught me alot about makeup and techniques, so thank you for posting! oh and btw happy belated birthday :) looked like you had a great time! hello! if you are wondering where and how to buy BRTC and L'EGERE bb creams, i can be of help coz i am based in Taiwan right now and I can sell them directly to you.